You know Melvin Gordon is currently one of the finest running back players in the National Football League, right? Well, you would be surprised to learn he is even better than the player you believe he is if you keep up with his career stats and attainments. Even before this chap was introduced to the NFL by the Los Angeles Chargers, then known as San Diego Chargers, he brought down so many walls in the game, starting from when he was a junior in high school. Check the records, you will find that the Wisconsin Football Coaches Association (WFCA) listed him in their All-state and All-region teams. In his senior year, he was super-phenomenal, WFCA and Associated Press couldn’t stay away from naming him among their first-team All-state lists. 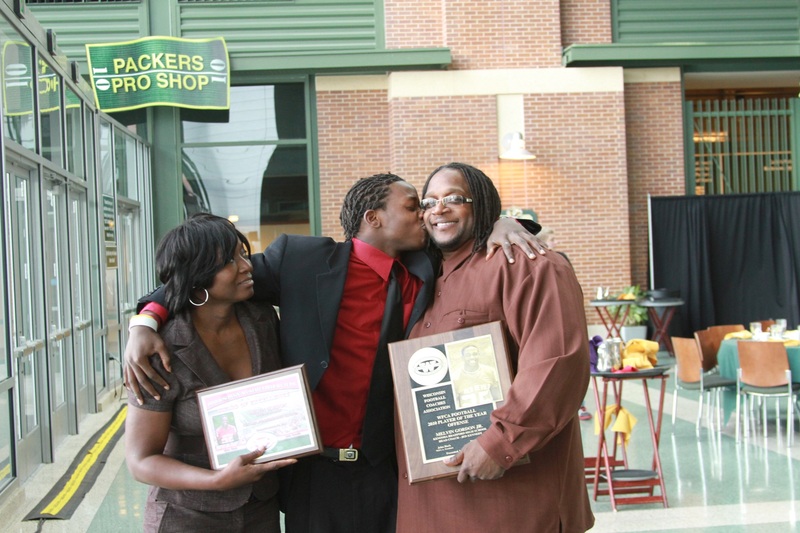 Above all, Melvin emerged as the Gatorade Football Player of the Year. It was anticipated that Mr. Gordon would have a remarkable college career and he sure did, accumulating a very fast range of awards while he established numerous records. Even as it would be tasking and quite unnecessary to list out all his records, a handful of the accolades he bagged include the Chicago Tribune Silver Football Award, the Doak Walker Award, and the Jim Brown Trophy, all in 2014. From his biography to other facts about his life and career, here are the things one ought to know about the Bolts superstar. It was in Kenosha, Wisconsin that Melvin Gordon III was born and brought up; his date of birth was on 13th April 1993. Owing to the fame he has come to enjoy as a footballer, details of his accomplishments in the sports have towered above his family life, casting a shadow over other things one may desire to know about his upbringing and parents. Nonetheless, we can tell that his dad, Melvin Gordon Sr. better known as Big Bo is still married to his mom, Carmen Gordon (a nurse). From what we learned, Big Bo was a drug dealer, he sold cocaine which the running back once described as his only source of income. Irrespective of the fact that the law caught up with Big Bo and jailed him, Melvin believes he is a great dad and regards him and Carmen as his biggest supporters. Melvin is his parent’s only child. As a student of Mary D. Bradford High School in Melvin’s hometown, it became obvious that this bloke would thrive as a sportsman. Melvin wasn’t only good at football, he equally excelled in track and field events. Several platforms listed him as one of the best prospective athletes and this had a good number of universities showing up to have him have his college career with them. Melvin got offers from the University of Wisconsin–Madison, Michigan, Iowa, and Louisville. He first embraced the University of Iowa offer but later abandoned it for that of the University of Wisconsin. Unlike most footballers who only start to gain significant attention during their college career, Melvin was very much popular right from his high school days. While the fact of him being athletically inclined attracted much attention to him, his popularity soared when ESPN named him the best player in the north-central U.S state with Rivals.com rating him as a four-star recruit. The biggest achievement of Melvin Gordon’s professional career thus far is definitely, his participation in the 2016 all-star game of the NFL. Other highlights and awards of his career were as a college footballer. Among the plenty recognition he received, the prominent ones include his 2014 unanimous naming to All-American and First-team All-Big Ten. In the same year, he was decorated with the Doak Walker Award and also honored as the Big Ten Offensive Player of the Year. That’s not all, Melvin was as well Big Ten Champion in 2011 and the next year. Owing to the fact that many people have shown interest in knowing the extent of the wealth this offensive player has accumulated, several figures have been quoted as his net worth but none of them can be authenticated as they are all guesswork. Nevertheless, it is common knowledge that the four-year contract this dude signed with the Chargers in May 2015 is worth $10.66 million. The amount is fully guaranteed and came with a $6 million signing bonus. Melvin Gordon is an inch taller than 6 feet and weighs 215 lb. We are yet to confirm other details of his body measurements.